My husband and I are working on saving money and eating healthier by eating out less. We have tried meal planning in different ways before, but since we are getting more serious about it, I saw an idea on Pinterest and went for it! Usually we focus on planning dinner for my family, because we buy the same sorts of things for breakfast and lunch each week. With this strategy, you plan your meals on the same page as the shopping list. 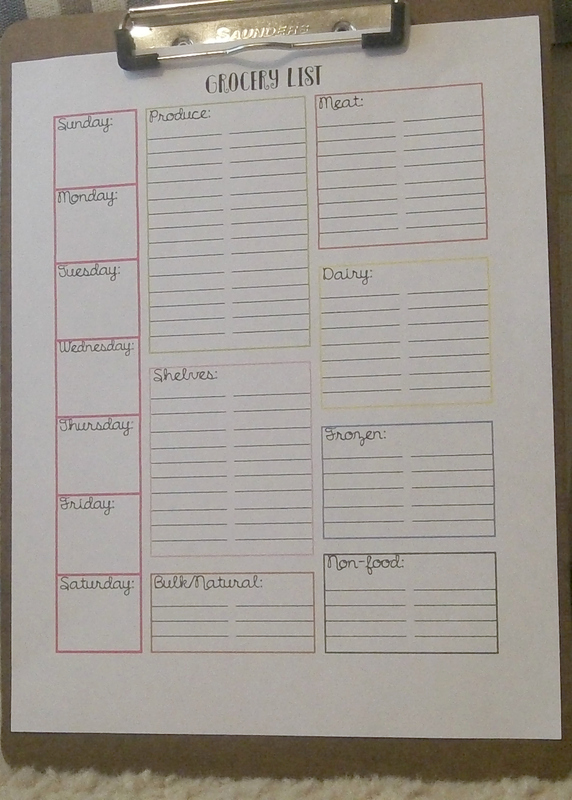 And if you plan for more than a week in advance, you can print out multiple sheets. I am thinking I’ll print a new one each week, but to be more environmentally friendly, you could print once on cardstock and either laminate or put in a plastic cover and use a dry erase marker to reuse. My issue with that was dragging around a laminated full-page to the grocery store, because I tend to fold my shopping lists enough that I can fit in a purse or pocket. I customized it by how I shop. Produce is when you first walk in our grocery store, and it’s the biggest section because we buy a lot of produce. Its box is green, because that’s the color produce makes me think of. Meat is slightly bigger. We buy our dinner meats from the meat counter section. Outline is red. Dairy is decent-sized because we buy a lot of dairy. Milk, cheese, cheese sticks, yogurt, eggs, taco shells, tea, ham… The outline is yellow kind of like cheese/egg yolks. Frozen is blue, and we buy a lot of frozen veggies and sometimes some ice cream or some treat. Non-food would be like dog food, trash bags, pharmaceuticals, etc. The outline is black. Could also include a deli section, but we don’t buy anything from there. How would you make your list customized for your needs? This entry was posted in DIY, Health, Organization, Spreadsheet and tagged DIY, Excel, excel spreadsheet, grocery, grocery list, meal plan, meal planning, organize, organized, organizing. Bookmark the permalink.